We offer a delivery service to Melbourne Metro customers only. A turnaround of 5 Business Days after order placement is offered. On rare occasions there may be unexpected delays for your order being delivered in which case we will contact you with more information. We offer a delivery service to Melbourne Metro and Victorian country customers. The turnaround time will vary throughout the year, but 6-8 weeks would be a good guideline. We Offer a delivery service to Sydney Metro customers. A turnaround of 15 – 20 Business days after order placement is offered. On rare occasions there may be unexpected delays in delivering your order in which case we will contact you with more information. We offer a delivery service to Sydney Metro and Sydney regional customers. The turnaround time will vary throughout the year, but 6-8 weeks would be a good guideline. Furniture can be picked up from our warehouse in Boronia. An appointment needs to be made as the warehouse is not always staffed. A large vehicle with appropriate padding is required as all items are assembled. 2 people will be required to pick up as our warehouse staff may not be able to help loading. All our furniture arrives assembled, so we use Specialist Delivery services who are trained to properly blanket and secure your furniture during transport. Although the furniture is assembled, some installation will be required by the customer. Therefore a cordless drill and some very basic D.I.Y. skills will be required. Please see notes under installation. A full assembly service is offered with nothing required of the customer. Ground Floor is considered to have a maximum of 3 steps up or down. Where more steps are required, 2 x delivery people are required, therefore upstairs delivery surcharge applies. We are able to deliver furniture upstairs. An additional fee applies. This also includes floors accessed via lift. DELIVERY AND PICK UP DAYS. We operate Monday to Friday between normal business hours. Someone is required to be home to accept delivery. As goods are signed for and received in good condition, it is recommended that furniture be inspected prior to signing. Delivery cost involves placing assembled items in a single location. Delivery cost includes placement of items wherever required. Installation Includes screwing hutch, return, and / or fixed pedestal to desk. We also attach handles, place shelves within each unit and provide basic cleaning. 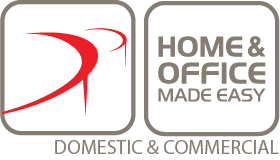 Please Contact Home Office Made Easy for price lists that detail all furniture pricing and respective delivery and installation charges.